McAree Brothers, established in 1878, are described by current fans familiar with their shop in King Street as “knitting heaven in Stirling” on account of their yarn stock and knowledge of the world of knitting. As can be seen from this photograph of c1900, they have always had a close relationship with wool. 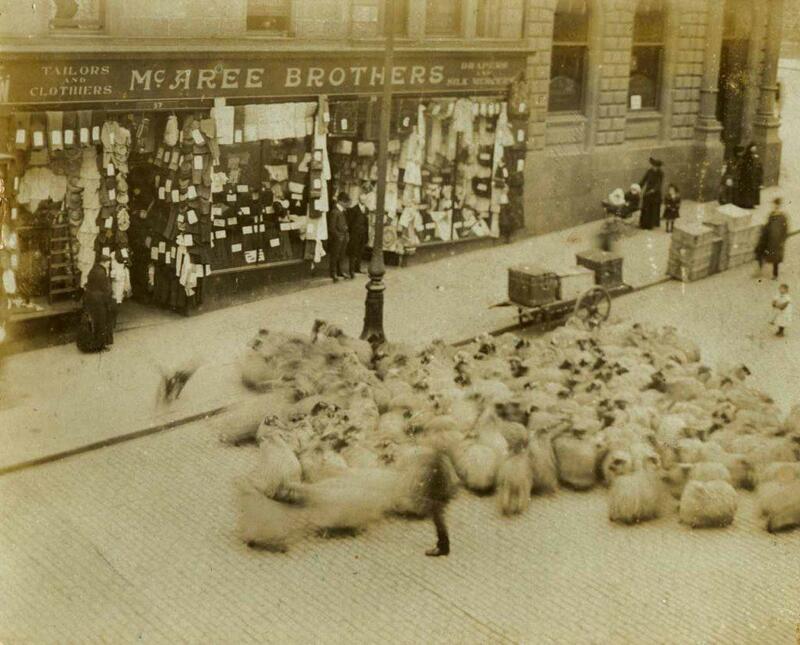 The flock of sheep are on their way to the market in Wallace Street, and on market days, sheep were as common a sight in King Street as cars are today. On one occasion, a sheep broke loose and had to ousted from McAree’s front window display. Working with the Danish Cultural Institute, McAree’s have sponsored the creation of a large woollen piece called Knitworks, now on show in the Stirling Smith until 29 August. It is made of 15 x15 centimetre squares, some of which are by knitting designers from Scandinavia and Scotland, and others by visitors to the Nordic Knitathon Workshop at the Edinburgh International Fashion Festival in the National Museum of Scotland. The Smith is the first venue for its Scottish tour; admission and parking are free.